Basically: They took a Pepsi basketball commercial and made it into a full movie. The summer 2018 movie season seems like a Disney theme park and while we wait in lines (or should I say while we wait for weeks until the next ride) something surprising is hitting the theaters. Uncle Drew is a fictional playground basketball legend created by NBA star Kyrie Irving, for a series of Pepsi Max commercials. 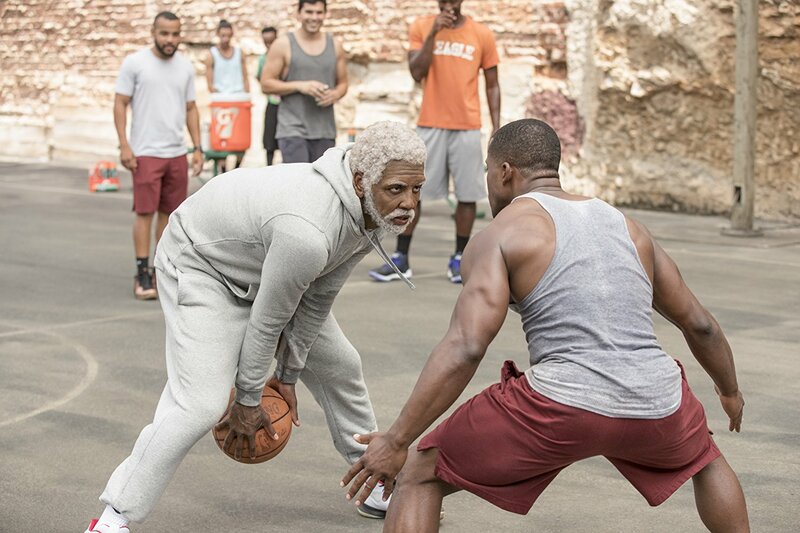 In the popular ads, Kyrie hits the basketball courts in full old man makeup and surprises real people by completely besting them at the game—which is not what they expect from a man in his 70s. The commercials continue with a story of Drew going around the country to find a member of the team from his youth, in order to teach the “youngbloods” the true ways of basketball. The movie basically takes this plotline and adds a new character Dax played by Lil’ Rel Howery, a down on his luck man who has put everything that he has, time and money, into his Rucker Park Classic (it’s world famous, look it up) basketball team only to see it stolen away (along with his girlfriend) by his middle school rival Mookie (Nick Kroll). The desperate Dax runs into urban legend Uncle Drew, after seeing him school some guys on the court, and Dax convinces Drew to play for him at the Rucker. Drew’s only stipulation is that Dax help him get his friends back together to play with him. A road trip ensues as the twenty-something guy who’s playing a seventy-something guy mixes up a generational mishmash with an actual thirty-something guy. 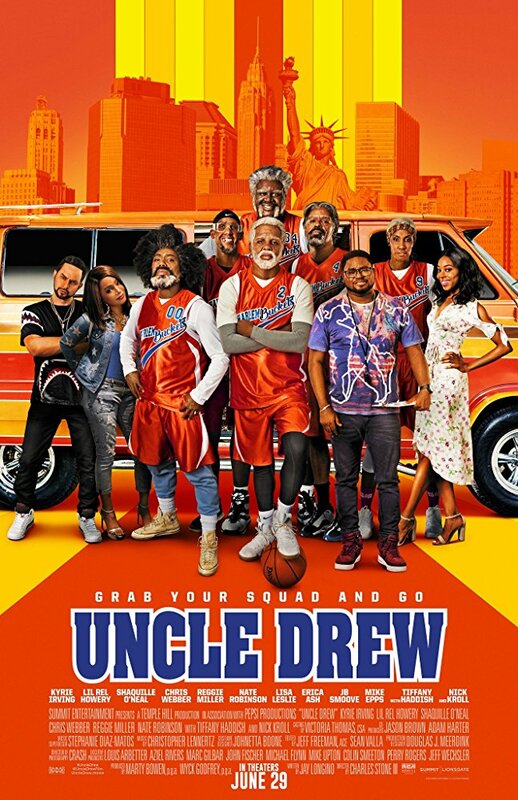 It works best when you don’t take any of Uncle Drew seriously, the movie itself seriously doesn’t. 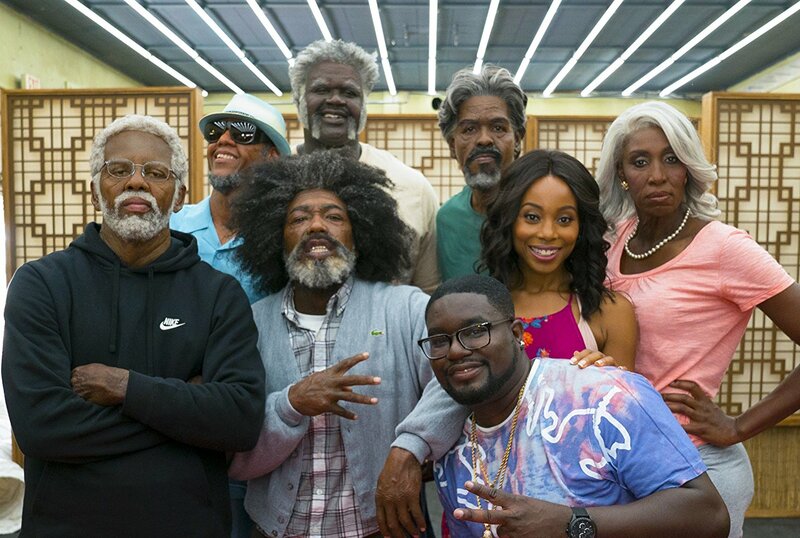 What you’ll get is a bunch of former pro-basketball players having a great time in makeup, playing really old people who can still ball at amazing levels. Uncle Drew, as a movie, excels at being funny for a wide audience, it’s just entertaining. It’s not super smart, wink wink nudge nudge, comedy but it has a kind of In Living Color cool. Another enjoyable part of the movie is the basketball. There are some great scenes in this for people who love the game or for people who just like to see cool dunks. This has some of the best streetball sequences since White Men Can’t Jump twenty-five years ago. The comedians in this cast really hold the movie together. They come through either with big outlandish performances by Nick Kroll and Tiffany Haddish, or with more straight man antics like the lead Lil’ Rel. Rel is great at bouncing off the likes of charismatic athlete movie vets like Shaq. And it’s surprising just how much fun it is to watch Chris Webber play a preacher with Lisa Leslie as his wife. One of the few things that didn’t work is the length. There are a few times when Uncle Drew drags, like it doesn’t know how to transition well to the next part of the plot. It can feel aimless at these moments and the jokes don’t pop when they get a bit more serious to move the characters forward in their arcs. Maybe the movie should’ve been around 95 minutes but that doesn’t hurt it that much. Haddish is also a bit too on type, which I hope she’ll move out of. While she’s good at being her, let’s hope she’s not typecast into one type of performance. However, Haddish and Howrey do work well together as former lovers, a flashback to their characters’ relationship on The Carmichael Show (NBC). Uncle Drew is totally worth seeing and might be a must-see for basketball fans who are missing the NBA season (while everyone else is talking about The World Cup). In The End: Go sit down in a cool theater for a nice light summer sport comedy that will have you yelling “BUCKETS!” while you laugh a lot.